The Massachusetts Legal Assistance Corporation funds nonprofit legal aid organizations that offer free legal advice and representation to Massachusetts residents who face civil legal issues related to: housing, domestic violence, access to health care and disability benefits, wages and employment benefits, veterans’ benefits, immigration, elder law issues, and more. In most cases, people must have incomes at or below 125 percent of the federal poverty level to qualify for legal aid. In 2019, that means an annual income at or below $32,188 for a family of four. • Adhere to policies put forth by the MLAC Board of Directors. These policies, other requirements, and expectations are set forth in the applications. The organization’s executive director and its board chair/president must submit assurances that, if awarded funds, the organization will comply with all policies and requirements. 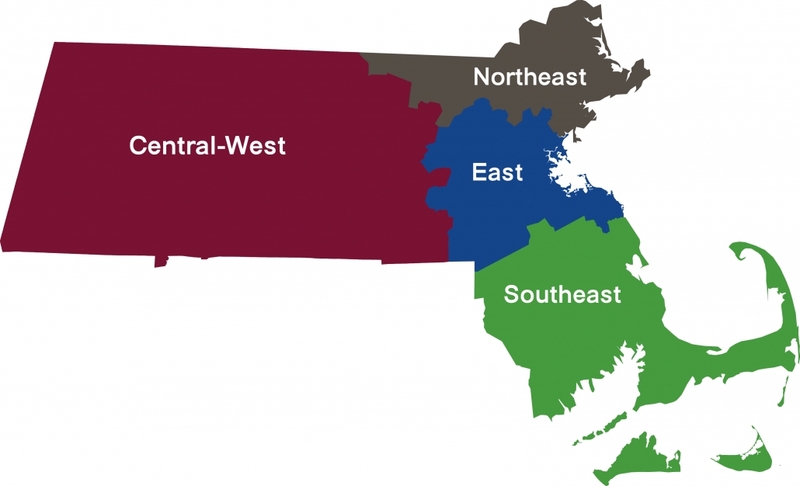 • Regional Legal Aid Funding – At least 80 percent of unrestricted MLAC funding goes to regional legal aid organizations that deliver a full range of civil legal services in different regions of Massachusetts. Regional Legal Aid Funding is allocated based on the number of low-income people in each organization’s geographic area, as determined by census data. See map below. • Statewide Legal Aid Funding – Up to 20 percent of unrestricted MLAC funding is dispersed to organizations that provide services statewide. – The Disability Benefits Project provides additional funding to organizations that deliver civil legal aid to people seeking disability benefits. – The Medicare Advocacy Project provides additional funding to organizations that deliver civil legal aid to people in need of Medicare advocacy. – The Domestic Violence Legal Assistance Project provides additional funding to organizations that deliver civil legal aid to survivors of domestic violence. A list of MLAC-funded organizations appears here. • Civil Legal Aid for Victims of Crime – With funding from the Massachusetts Office for Victim Assistance, MLAC supports legal aid organizations that provide help to people who are victims or survivors of a crime and who face civil legal issues caused by that crime. • Greater Boston Immigrant Defense Fund – A partnership between MLAC, the City of Boston, and several philanthropies that funds legal aid organizations and community organizations that assist immigrants facing potential deportation.